Large paraesophageal hernias are difficult to manage via laparoscopy and are associated with a significant recurrence rate. A novel laparoscopic approach was used to close the diaphragmatic defect in four patients diagnosed with large para-esophageal hernias and GERD symptomatology. Technique: All procedures were performed via laparoscopy. Three patients underwent a reduction of the para-esophageal hernia with a Nissen Fundoplication and one with Collis-Nissen fundoplication. Standard crural closure was performed over a #60 Fr Bougie in two patients and two patients did not undergo a crural closure. In all four patients, the left hepatic lobe was freed, re-positioned and anchored under and inferior to the gastro-esophageal [GE] junction, propping the GE junction anteriorly and, thus entirely covering and closing the entire hiatal hernia or diaphragmatic defect. Results: Post operatively, all patients did well without notable, unusual complaints. Average length of stay was 2.0 days. Although this data is not statistically significant, all patients had no recurrence of symptoms or of their para-esophageal hernia at 8,9,11 and 15 months post procedure. 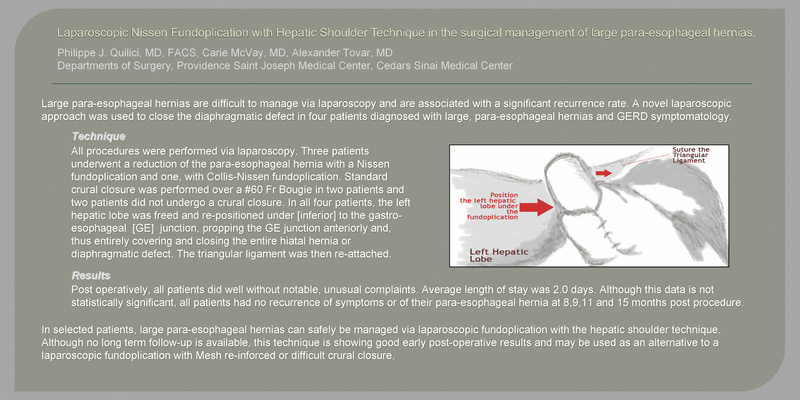 Conclusion: In selected patients, large para-esophageal hernias can safely be managed via laparoscopic fundoplication with the hepatic shoulder technique. Although no long term follow-up is available, this technique is showing good early post-operative results and may be used as an alternative to a laparoscopic fundoplication with Mesh re-inforced or difficult crural closure.